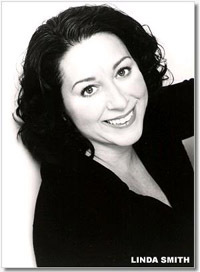 Linda Smith has been teaching and coaching comedy for over five years. She has taught hundreds of aspiring comedians as well as actors and celebrities, including the Today Show’s Ann Curry. She was born and raised in Cresskill, New Jersey, about 9 miles from the George Washington Bridge. After graduating from High School she moved to Boston Massachusetts to begin a career in stand-up comedy while always working towards returning to the New York area. Four years later she was back and working all the major clubs in New York City. Linda went on to become a headliner at clubs and colleges across the country. She also appeared as a featured comedienne on numerous television programs including The Conan O’Brien Show, HBO’s Women of the Night, and countless programs on Comedy Central. Her more recent television appearances were Good Morning America Now, The Today Show and CW11 Morning News. Eventually she made the transition into comedy writing for television. For 3 years she was a staff writer on the Emmy Award winning Rosie O’Donnell Show. After that she became a staff writer for the Caroline Rhea Show and then a freelance writer for HBO. All the while she was maintaining and honing her live stand-up act. Currently in addition to working the clubs, Linda is teaching comedy writing and performance at Carolines School of Comedy and she has a private coaching business. Carolines first opened as a cabaret in New York’s Chelsea neighborhood in 1981. Owner Caroline Hirsch, a lifelong comedy fan, soon began booking comedians. The comedy acts – which included now legendary performers like Jerry Seinfeld, Tim Allen, Rosie O’Donnell and Jay Leno – were a tremendous success, and Carolines soon became a full-fledged comedy club. As comedy’s popularity surged throughout the 80s and into the 90s, so did Carolines. Now located in the heart of Times Square in New York City, Carolines on Broadway is one of America’s premier comedy nightclubs, presenting the best live entertainment seven nights a week, 365 days a year. For more information about Carolines on Broadway, visit Carolines.com. “I remember going into this place and realizing that I was part of something so different and so unique. You saw people that were being funny like funnymen, but they weren’t the old Borscht Belt comedians. It was a different style. That was the catalyst for me,” he says. Sheer tenacity and that genuine love for the business enabled Faranda to move up the ranks and eventually become the club’s booker. While there, he gave a leg up to such then-unknown talents as Jon Stewart, Ray Romano, Rosie O’Donnell and Adam Sandler. His knack for spotting a great act caught the eye of Caroline Hirsch, owner of Carolines on Broadway, who offered him a job in 1994. Caroline Hirsch was a marketing executive at Gimbels Department Store in New York City when a few friends asked her to start a nightclub with them. After some arm-twisting, she agreed, and in 1981 they opened a cabaret called Carolines. The cabaret became a comedy club, then the most influential comedy showcase in the country. Before Jerry Seinfeld became Seinfeld and Paul Reubens became Pee-Wee Herman, they graced the stage at Carolines. In 2003, 175,000 customers flocked to her chic art deco club on Broadway. Hirsch’s uncanny ability to spot rising stars has earned her a reputation as something of a comedy oracle. Read a full interview with Caroline Hirsch at Inc. Magazine. Like Us, Because We Like You.